Artificial Flavor (Contains Modified Food Starch), Citric Acid, Sugar, Red 40. Place 2 gallons of cold tap water into a sanitized mixing container. Stir in one flavor packet with wire whisk. When flavor packet is thoroughly dissolved, add one 6 lb. bag of Frostline dry mix. Blend according to the directions and place in a soft serve machine or store in refrigerator. 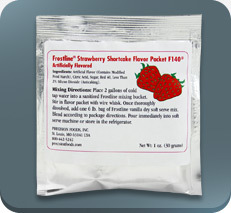 ** Note: Frostline Flavor Packets can also be used to flavor Frostline Smoothie Base Mix. See Smoothie Base Mix Spec Sheet for details. **FDA requires product temperature to reduce to 41ºF within four hours.